If you want to stay on top of things with your smartphone, you've no doubt allowed notifications to pop up in your status bar. The trouble is that we have so many communication venues nowadays, and so many apps installed on our phone, vying for attention, that the notification bar quickly becomes crowded with alerts that pretend to need urgent attention. The new Echo Notification Lockscreen app tries to resolve the problem in a different way than simply pressing the "Clear" button, and getting rid of all alerts in one uncompromising swoop. 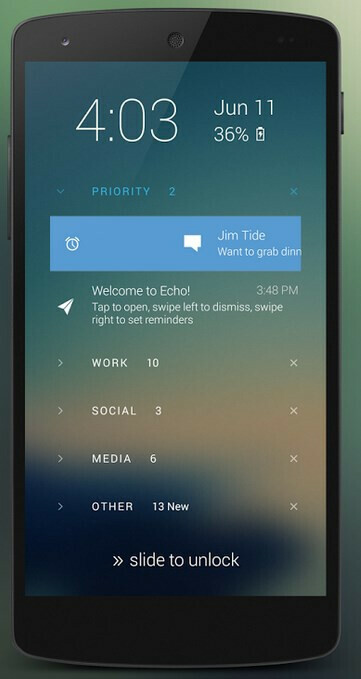 Echo organizes your notifications in different categories, straight from the lockscreen. The “Priority” alerts are where your most important stuff goes, and once you receive a message there, Echo will turn your screen on, but not for less urgent categories, like “Work” or “Social.” The “Priority” category is gradually populated over time by learning your habits, and is based on the notifications you open most often. The categories that appear on your lock screen can be further expanded to show their content, and notifications dismissed individually or in groups, straight from your lock screen. The Echo Notification Lockscreen app is still labeled as "beta,” so it's a bit rough around the edges, but holds plenty of promises, so give it a try if you want to see some order in your notification chaos. It looks good but it still has issues, I'd wait until then. is it compatible with Jellybean? Not yet. We built for 4.3 and above because of limitations with notification access. We do have plans to make Echo available for lower builds. Information on the other side of the phones lock screen does me no good, those that pick it up off table maybe. Can it be locked even? last time i checked it didnt work with 4.1.2... did they support that now? I think this app has a better approach on notifications: Touchless Notifications It shows and reads aloud my notifications as they come in, or I can say "What's up" and then it plays me kind of like a slideshow, and reads them out similar to the MotoX. Search for it in the play store. Thanks for posting about your app...on every article about Echo. How does it decide which notification goes to which category? Are you gonna make it available for the 4.1.2 ? You can change your wallpaper! Open Echo settings, and choose "set my wallpaper". You'll then be able to choose any image as your wallpaper. Works really nice in tandem with the smart launcher. after I updated the Echo app today 8/6/2014 when the screen locks I am unable to resume what I was currently doing once I unlock. so I had to turn Echo off. I loved using Echo until that happened.